EZ Flex is the most versatile media filter we offer. Whether you are starting with a brand new system, upgrading an existing Carrier system, or even if you have a competing brand already installed, you should be able to choose the best filter for the job. Designed to work with Carrier's new and existing filter cabinets, as well as many of those manufactured by Space-Gard(r), Trion(r) and Honeywell, EZ Flex is the perfect fit for enhanced indoor air quality. When you add up all the benefits - MERV 10 efficiency, low pressure drop and outstanding flexibility - it's easy to see why EZ Flex is a great choice for enhancing your home's comfort. It's exactly what you'd expect from Carrier, the most respected name in the indoor comfort industry. EZ Flex is designed specifically for use with Carrier heating and cooling systems. To the undiscerning eye, most media filters look the same. EZ Flex is truly different. Here's why: Most media filters have been developed by companies that specialize in air filtration. They do not manufacture heating and air conditioning equipment. As a result, their products do a good job filtering the air but significantly restrict airflow. This airflow restriction is commonly known as "pressure drop." Increased pressure drop will cause your heating and cooling system to run longer to deliver the same amount of conditioned air to your home. In short, the efficiency of the system goes down and your utility bills can go up. Other problems associated with excessive pressure drop are decreased life expectancy of the system and in severe cases, cooling or heating system shutdown can occur. 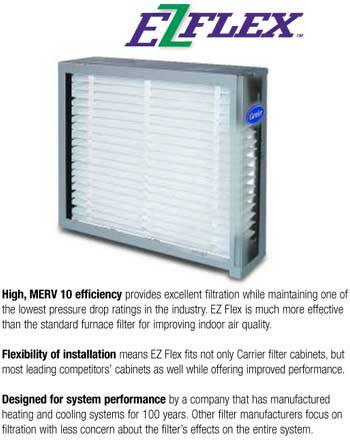 EZ Flex provides "efficient" MERV 10 removal of airborne particles to circulate cleaner air throughout your house. EZ Flex effectively traps pollutants as small as .3 microns in diameter. That means it will remove bacteria, pollen, plant spores, some viruses, smoke, animal dander, lint and dust from the air to improve the quality of the air you breathe. Space-Gard® and Aprilaire®, and the Space-Gard and Aprilaire, logos are registered trademarks of Research Products Corporation. Carrier® and Additional logos, brands, models, and product information are registered trademarks of their respective manufacturers and/or owners. Consumer information is NEVER distributed to outside parties of the transaction.